Come celebrate spring and the upcoming summer season with a trip to the beach and the 3-mile boardwalk of Ocean City, Maryland for the annual Springfest celebration! Springfest is four days of delicious food, free live entertainment and unique arts and crafts under four huge big top tents located in the Inlet Lot at the south end of Ocean City's famous Boardwalk. Come celebrate spring and the upcoming summer season with a trip to the beach and the 3-mile boardwalk of Ocean City, Maryland for the annual Springfest celebration! Springfest is four days of delicious food, free live entertainment and unique arts and crafts under four huge big top tents located in the Inlet Lot at the south end of Ocean Citys famous Boardwalk. Springfest serves up a continuous variety of musical performances on two stages. Indulge your appetite and enjoy a variety of delicious foods, which runs the gamut from famous Eastern Shore delicacies to a diverse assortment of ethnic foods, served up by over 30 food vendors. Springfest artisans will amaze and delight you with traditional and contemporary arts and crafts creations. With sandy beaches and the Atlantic Ocean in the background, dont miss out on a day of great live entertainment, delicious food and unique arts and crafts all along Ocean Citys Boardwalk! Note: There will be no rest stops made either en route to Springfest, or on the return trip home. Come celebrate spring and the upcoming summer season with a trip to the beach and the 3-mile boardwalk of Ocean City, Maryland for the annual Springfest celebration! 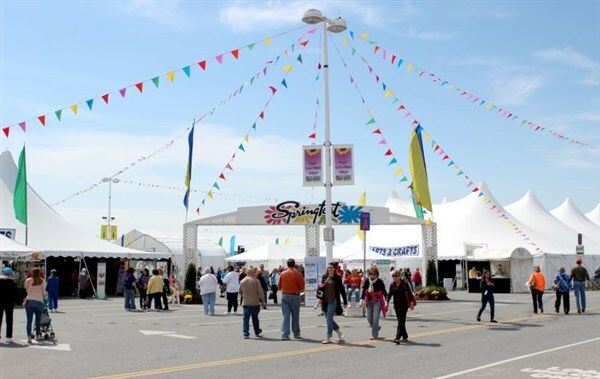 Springfest is four days of delicious food, free live entertainment and unique arts and crafts under four huge big top tents located in the Inlet Lot at the south end of Ocean City’s famous Boardwalk. Springfest serves up a continuous variety of musical performances on two stages. Indulge your appetite and enjoy a variety of delicious foods, which runs the gamut from famous Eastern Shore delicacies to a diverse assortment of ethnic foods, served up by over 30 food vendors. Springfest artisans will amaze and delight you with traditional and contemporary arts and crafts creations. With sandy beaches and the Atlantic Ocean in the background, don’t miss out on a day of great live entertainment, delicious food and unique arts and crafts all along Ocean City’s Boardwalk! Note: There will be no rest stops made either en route to Springfest, or on the return trip home.